The lodge combines the romance of turn of the century rustic-style living with modern conveniences, in suite bathrooms featuring 100 year-old claw-foot tubs. 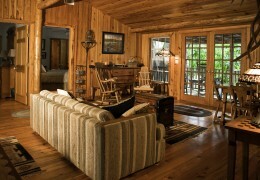 Each suite shares common living room area, library, full kitchen, and large back porch filled with rocking chairs. Enjoy tree ripened oranges from the back porch when in season. *Rates starting at $99 per suite/2 night minimum. One of the 2 original doctor’s offices located in the old historical town of Ft. McCoy, originally named Ft. McCade. The doctor and Marjorie Kinnan Rawlings were reported to be best friends by the son of the doctor. It is rumored that she would stop by frequently to pay her respects and to gather material for her next story. 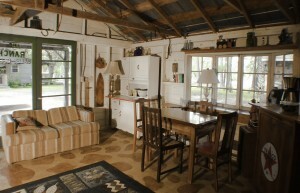 The cottage overlooks the vast pasture areas and grassy pond. This exclusive one-room cabin is a turn of the century 100+ year-old cabin featuring a private bath with an original claw-foot tub and a private front porch. This Cabin is equipped with microwave and refrigerator. *Rates starting at $89 per night/2 night minimum. The Safari Room is a bunkhouse hidden in the shade of a tropical 200 year-old oak tree, fringed by the pristine crisp air blowing across the ponds of the ranch. A wooden walkway leads to the bathhouse with adjoining shower and basin. 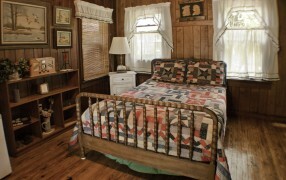 The bunkhouse is famous for its intricate detail and is uniquely decorated with antique-accents. The simple, yet creative design of the bunkhouse offers a rustic camp-experience and a shared privacy for a family or close friends who wish to choose the bunkhouse experience. Sleeps 4 with a bunk bed and 2 couches. *Rates starting at $89 per night/2 night minimum. There are many spacious guest areas, as well as a welcoming sitting area. Indoor/outdoor dining areas perfect laid-back viewing of wildlife whilst relaxing after a long day. Relaxing in one of the candle-lit outdoor areas in the evening has been a favorite past-time by many of our guests, before enjoying old Florida cuisine uniquely created alfresco style or in the small rustic dinner area. 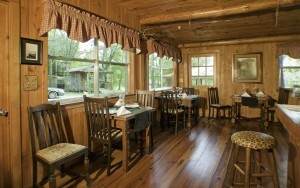 Private dinning and banquets may be arranged by special request. *Rates include simple, exquisite breakfast fare for each guest. Guests are welcome to join the hosts for lunch and dinner upon special requests. Each ranch experience is tailored to fit the guests needs. Share your wilderness experience with your friends or club members in an isolated location that can be reached by hike-in or kayak. We can transport your heavy gear and even set up your camp. Don’t have the camping gear you need? For a nominal fee, we can provide it for your stay. Some past guests have even requested use of our C-9 parachute as used by the Air Force S.E.R.E. program. This 28′ diameter parachute provides a shaded, waterproof shelter for your campsite. *Rates starting at $25 per night/2 night minimum. No charge when attending our two day classes. 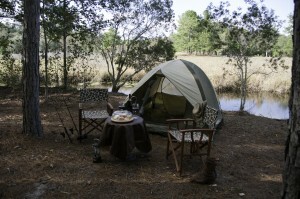 The Outback under canvas is an exciting option at Out of Ocala Wilderness Retreat and School. Located adjacent to one of the states many wildlife refuges, you’ll be right where the action is. 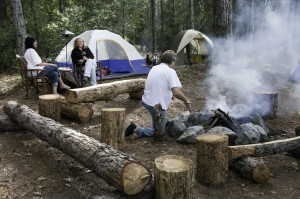 You will have private accommodations where you can perfect your newly acquired skills or relax and enjoy nature. You will be living amongst the many wonderful animals that inhabit our great state. Imagine… a family of Sandhill Cranes as your newest neighbors! *Rates starting at $25 per night/2 night minimum. No charge when attending our two day classes.